Infra/Devops team maintains a Golden Image (Base Image) which is a production ready base image with pre-installed required software like java,tomcat,nagios-client, default-system users. For security patch or software version update we have to keep updating the Base Image which requires manual AMI updation and creation process. 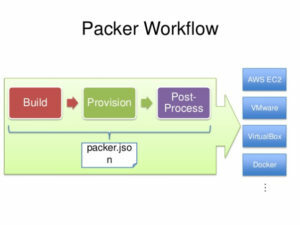 Packer is easy to use and automates the creation of any type of machine image.Out of the box Packer comes with support to build images for Amazon EC2, CloudStack, DigitalOcean, Docker, Google Compute Engine, Microsoft Azure, QEMU, VirtualBox, VMware, and more. Provide access_key and secret_key either in template itself or set environment variables AWS_ACCESS_KEY_ID and AWS_SECRET_ACCESS_KEY else it looks for the credentials file (.aws/credentials) in the user’s home directory. amazon-ebs Create EBS-backed AMIs by launching a source AMI and re-packaging it into a new AMI after provisioning. 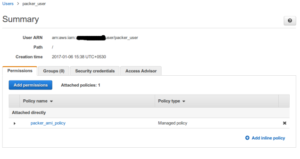 3)Create an IAM User named “packer_user” in AWS . 5) Attach the created Policy “packer_ami_policy” to user “packer_user” as shown . Provided chef url to install chef-client inside machine. Download and install packer on your Jenkins server and Create a “packer” folder and upload base_image.json file on your Github Repository. "How to access AWS from jenkins ? When i trigger packer build base.json i'm getting error AWS was not able to validate the provided access credentials in Jenkins".